Since I started roasting broccoli, I rarely make it any other way now. It's wonderful on its own, but I added the addition of grape tomatoes which made it even better! I bought 4 broccoli crowns, but it never seems to be enough. 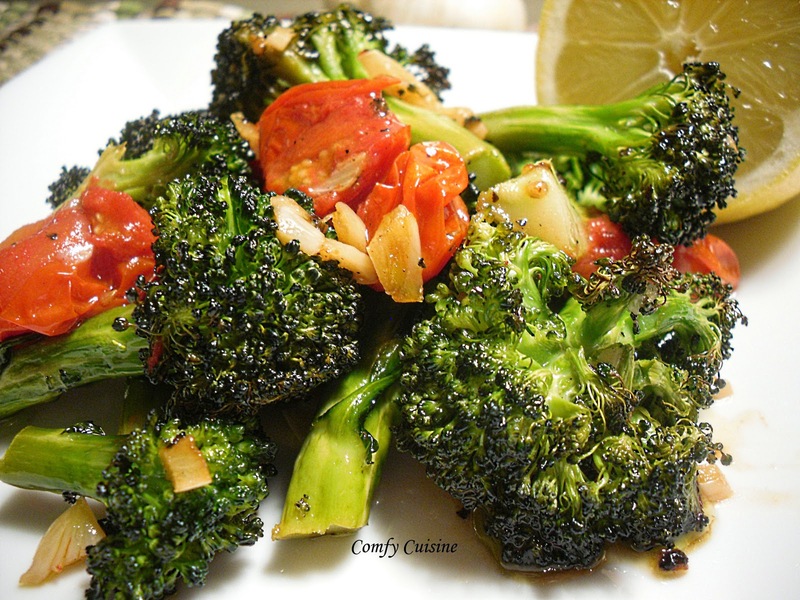 The roasted broccoli is crisp-tender, the florets become little crunchy bits, the tomatoes are soft and juicy and you get little tidbits of crunchy roasted garlic...what could be better!~ A quick, easy and healthy side dish. I really hope you will try this. Toss broccoli, tomatoes, oil, garlic, salt and pepper on a large baking sheets. Spread in an even layer. I can't give you exact measurements on the olive oil, just enough to lightly coat the broccoli. Bake until the broccoli begins to brown, about 20-25 minutes. 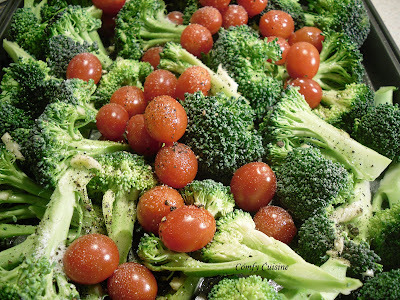 I gotta tell ya - I used to really hate broccoli growing up (as I suppose many kids do). But in the last couple of years, I am going crazy for it. I love it. And this one sounds sooo good with the tomatoes too! !